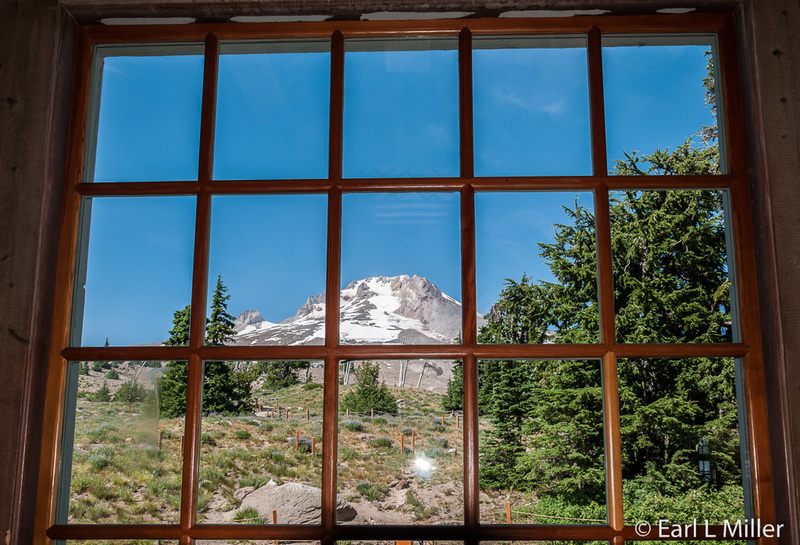 We spent our final weeks in Woodburn making day trips to attractions ranging from Bob’s Red Mill in Milwaukie to the Philip Foster Farm in Eagle Creek, Timberline Lodge at Mt. Hood, and the Mt. Hood Cultural Center and Museum at Government Camp. What ties the last three together is their historic value. 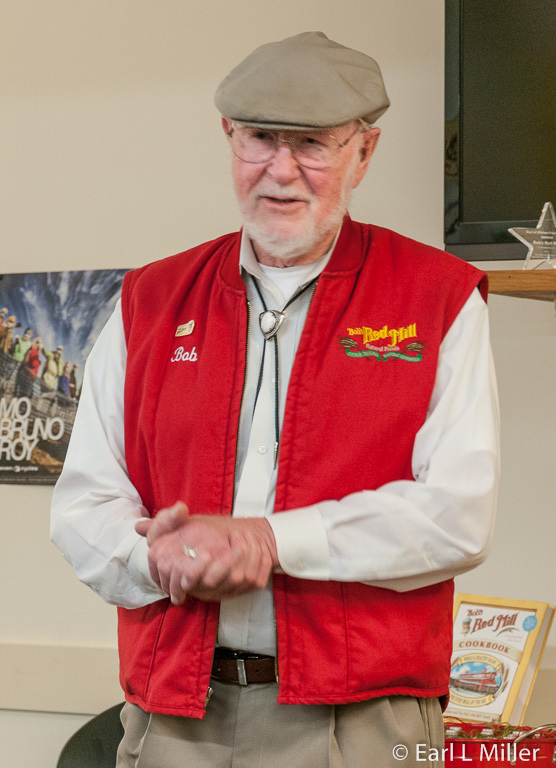 Bob’s Red Mill is important since the products made here are sold worldwide. If you are looking to tour a food company, head to Milwaukie. 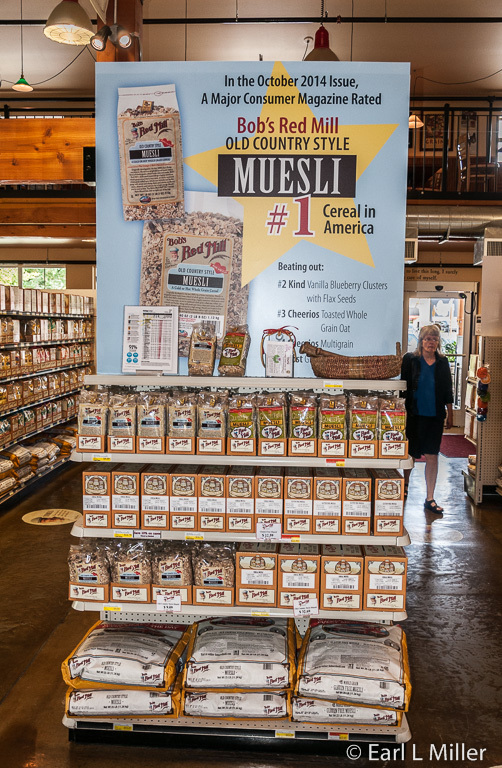 Bob’s Red Mill bills itself as the "nation's leading miller of diverse whole-grain foods." The firm’s philosophy is that whole grains help people keep a whole lot healthier, and whole grain foods should be used for every meal of the day. It produces about 400 products including flours, meals, cereals, granola, and mixes. Most of these are whole grain. Besides wheat, they mill quinoa, sorghum, buckwheat, golden flaxseed, and cornmeal. Another specialty is gluten free flour which is the firm’s fastest growing area. The production of more than 50 gluten free products is segregated in its own building with its own air filtration system. When the grains like rice and sorghum are received from growers, they are tested for contaminants in special clean room facilities. 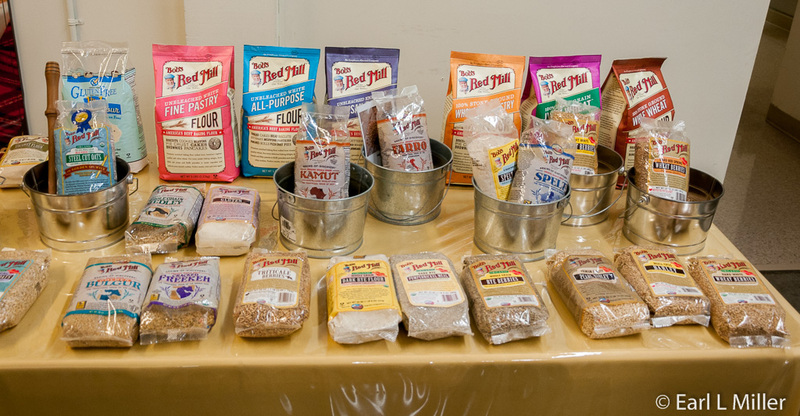 The mill also provides one of the largest lines of organic, whole grain foods in the country. This means their foods are produced without synthetic pesticides or chemical fertilizers. They also don’t contain genetically modified organisms (GMOs). Organic food production also supports farming methods deemed environmentally sound. 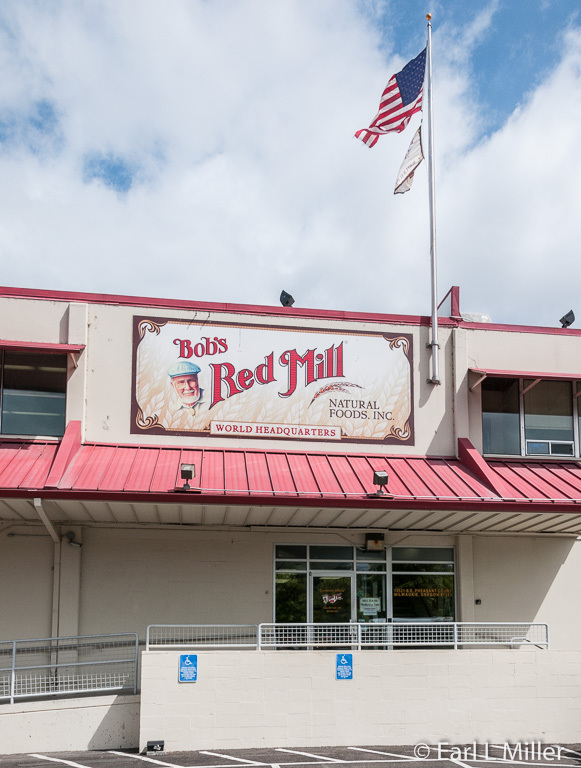 The USDA's National Organic Program required Bob’s Red Mill to complete a rigorous certification process before they could use the words USDA organic on their labels. He told us that on his 81st birthday he turned his business over to his employees through an Employee Stock Ownership Program. We also learned the Moores have personal relationships with the farmers in the United States and Canada who grow their grain. Certain grains grow only once a year, and the farmers store it for them. The firm’s story started in the mid 60's when Bob found a book about old stone-grinding flour mills. He found several old stone mills from an old North Carolina water-powered flour mill. Bob and his wife, Charlee, started their first mill in Redding, California. In 1978, they retired and moved to Oregon City. However, retirement didn’t last long. Bob came across an old mill for sale, purchased it, and was back in business until a fire destroyed the mill in 1988. The current site in Milwaukie, Oregon is a 325,000 square foot facility covering some seventeen acres. They have 420 employees. A tour consists of viewing the milling through one set of windows and the packaging through another. Note that you are not allowed to do photography through any of these windows. The firm still uses Danish quartz millstones rather than high speed steel rollers, pulverizers, hammer millstones, or steel burr mills. These preserve the important part of the grains since the firm strongly believes in “whole grain goodness in every bag.” Quality control testing is constantly done with each batch safety tested. Packaging, accomplished through 12 packaging lines, is in see through bags so consumers can see what they’re purchasing. Bob’s Red Mill sells in different sizes. For example, Costo sells 25 pound bags. Bob’s Red Mill has 40 loading docks at its 160,000 square foot distribution warehouse making it efficient for trucks to move in and out. Products are sold nationwide, throughout Canada, and in 81 countries with 260,000 single units in four pack cases shipped daily. In Mesa, Arizona you can purchase them at Basha’s and Sprouts. The company doesn’t fill an order until it is received from a store. You’ll also see antique milling equipment. Unfortunately, few have signs and our tour guide didn’t speak about what we were seeing except for Mill #1, the first set of stones used from 1885 to 2005. I also found our tour guide weak on answering questions such as when the Moores moved into this factory location. You do get samples at the end of the tour. They last 1-1/2 hours and are conducted during the summer, Monday through Friday at 10:00 a.m. and 11:30 a.m. During the rest of the year, they’re offered only at 10:00 a.m. The mill is located at 13521 SE Pheasant Court and (800) 349-2173 is their telephone number. About a mile from the mill, you can visit Bob’s Red Mill Whole Grain Store and Café. It contains hundreds of products and is also the place to purchase breakfast and lunch. It’s located at 5000 S.E. International Way and the phone number is (503) 607-6455. Located at the Bavarian style town of Government Camp, you’ll find Mt. Hood Cultural Center & Museum. It’s a small, four level museum whose six rooms are worth the 45 minutes to an hour visit. Its purpose is to interpret the history of Mt. Hood. This mountain village had its beginnings in 1849 tied to the Barlow Road. 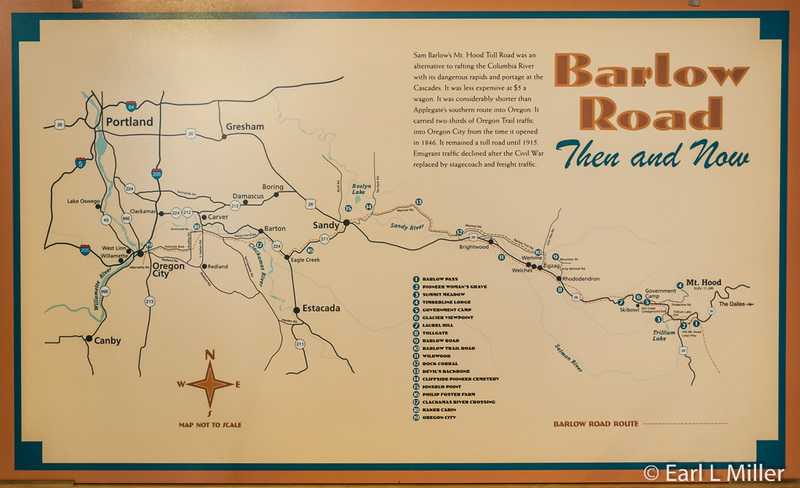 That was the toll road started by Sam Barrow which made it possible for Oregon Trail immigrants to travel from The Dalles across the south side of Mt. Hood and into the Willamette Valley to Oregon City. It was constructed to bypass the expensive and dangerous water route of the Columba River. In 1849, a large army regiment, moving from Fort Leavenworth, Kansas to Fort Vancouver, followed Barlow's route. When hit with heavy snows, they were forced to abandon wagons and supplies. After that, travelers referred to the area as "Government Camp.” A later attempt to change the village’s name to Pompeii never succeeded. This snow is the reason Government Camp continues to exist. At nearby Mt. Hood, visitors can ski year round. Area winter snow sports also continue to draw large crowds. At the museum, you’ll learn more about this story and about the Barrow Road. The road originally charged, in 1845, $5 per wagon and ten cents per animal. The rate was later lowered to $2.50 in 1863. 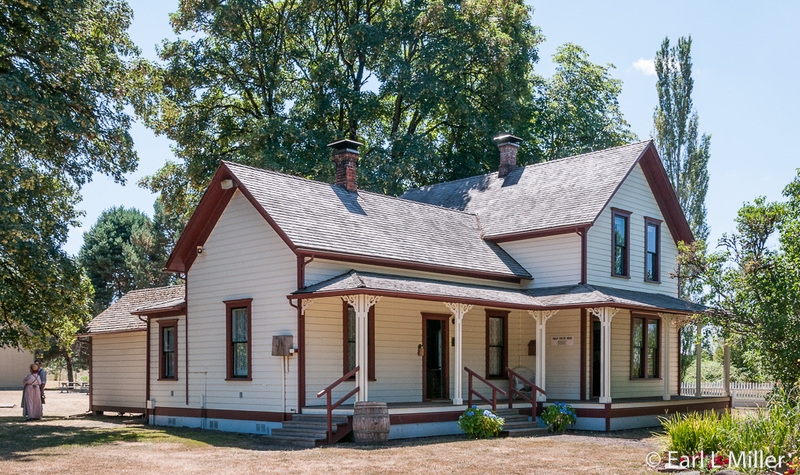 Barrow sold it to Philip Foster, whose original home and barn you can visit at Eagle Creek. Upstairs, in the section, Going Downhill Fast, you can view various types of skiing equipment. It also covers the evolution of skiing on Mt. Hood. 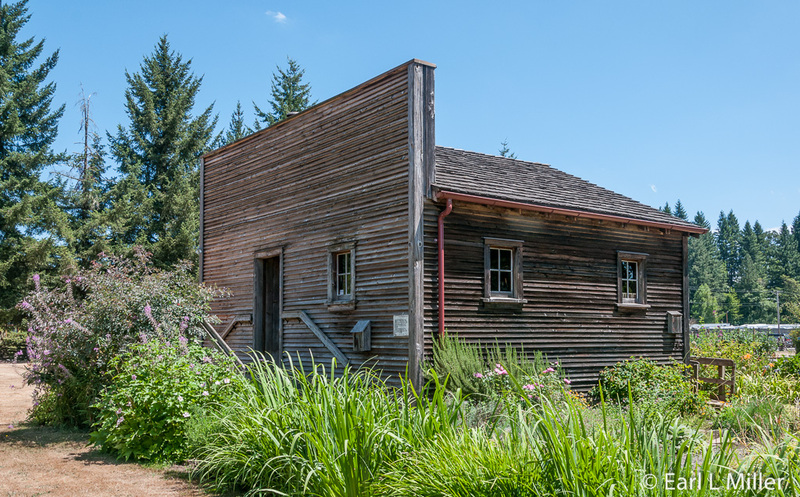 The Trailblazer’s Gallery covers the early explorers and pioneers, such as Barlow, who discovered and settled in this area of Oregon. The Mt. Hood Gallery is about the mountain’s volcanic nature. It’s also the natural history section where you’ll observe animal furs and skulls of Oregon’s large land mammals. Head for the basement for other interesting displays. 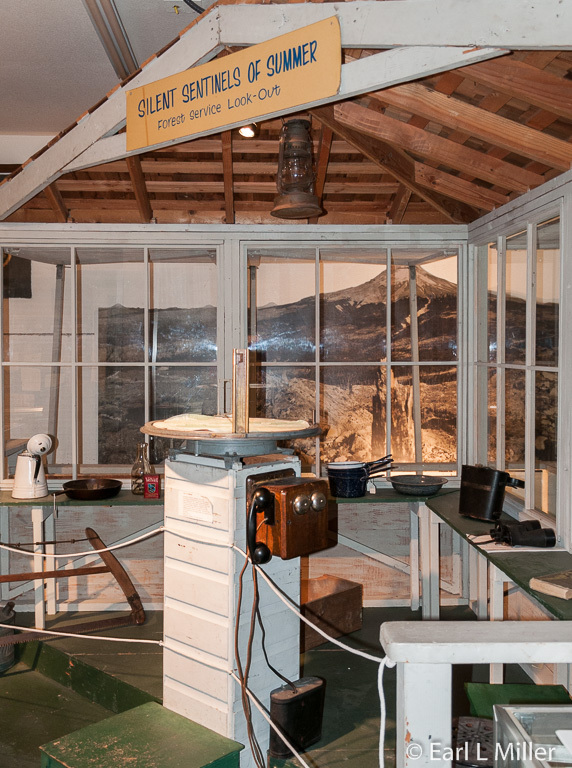 This gallery includes a working forest fire lookout, a 1920's rangers’ office, a Civilian Conservation Corp tribute, and other changing exhibits focusing on the Forest Service and the Mt. Hood National Forest. 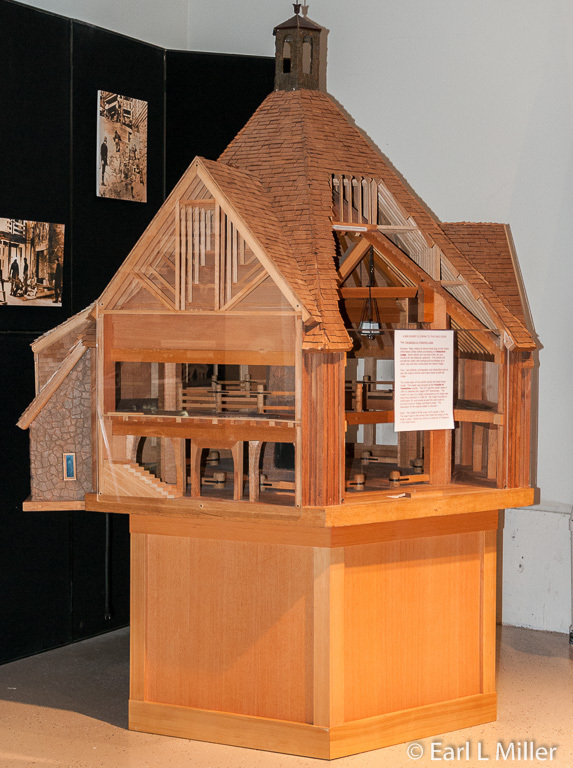 I was impressed with the model made in 1987 of the historic Timberline Lodge. It was taken to Washington, D.C. to promote Oregon tourism. 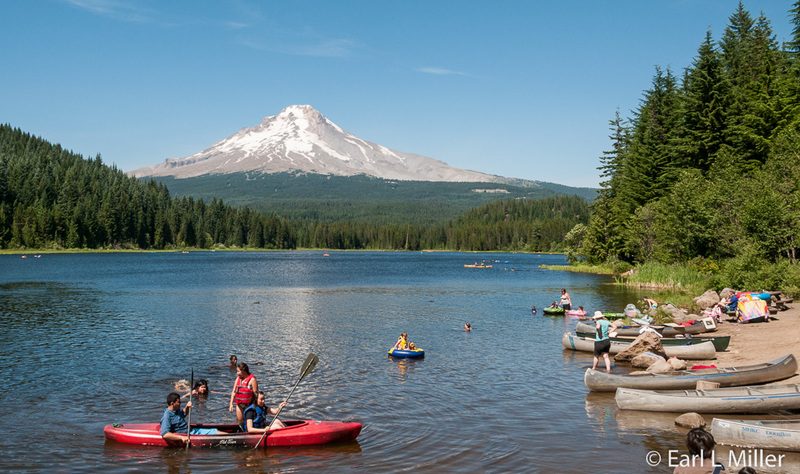 About two miles east of Government Camp, you’ll find Trillium Lake. It’s a popular spot for boaters and swimmers at the base of Mount Hood. The Mt. 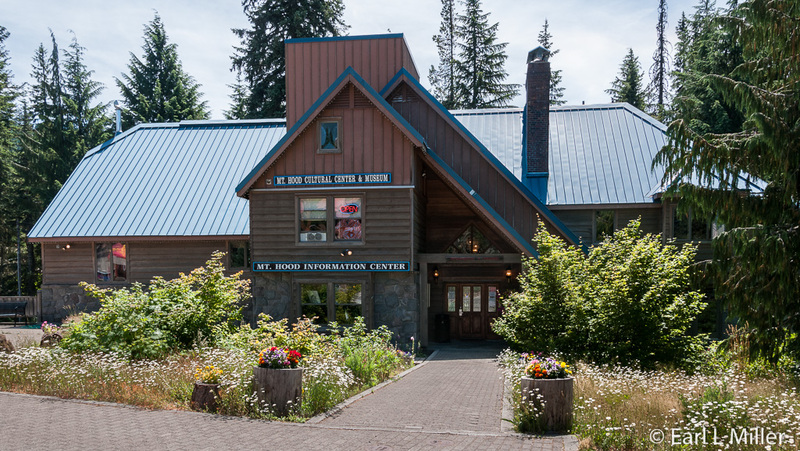 Hood Cultural Center & Museum is located at 88900 Government Camp Loop. Its phone number is (503) 272-3301. It’s open daily 9:00 a.m. to 5:00 p.m. Admission is free. In 1926, the U.S. Forest Service had plans to encourage private development of a lodge on Mt. Hood. The Depression changed everything. In 1935, Emerson J. Griffith was convinced by skiers to build a lodge. Logs came from the Columbia National Forest with columns for the head house hewn in two weeks. The building was enclosed before the heavy snows fell. WPA craftsmen ranging from blacksmiths to carpenters and cabinet makers worked on the interior and made the furniture out of scrap iron, heavy oak lumber, and rawhide. First the furniture was made. Then they created the blueprints for constructing them. Rugs were partly made out of corduroy. Flowers, that could be picked within one mile of the lodge, had their hues used in room color schemes. Very few fine artists were employed. Yet watercolors and oils with pioneer and Cascade Mountain schemes are found throughout. Carved linoleum, mosaic glass, and sculpted wood, stone, and metal work were all created. The key was to make the lodge representative of its surroundings. 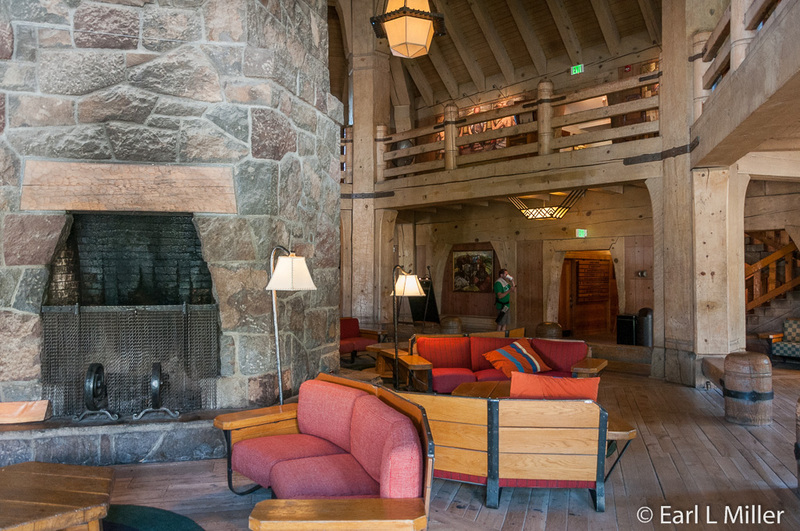 The lodge was dedicated in 1937 by President Roosevelt. It closed during World War II and was near ruin in 1955. At that time, Richard Kohnstamm took over the lodge and restored it. The Friends of Timberline became involved with the artwork and furnishings. The lodge added the C S Price wing in 1975 and the Day Lodge in 1981. Kohnstamm died in 2006, and his son, Jeff, is now the Area Operator. 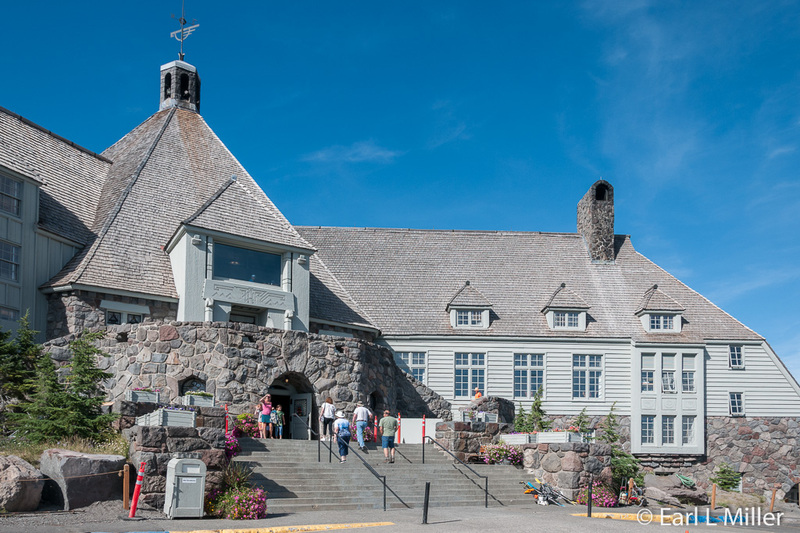 Timberline Lodge, a National Historic Landmark, is considered by many a Pacific Northwest headquarters for skiers, fishermen, mountaineers, and wildflower lovers. It’s the only ski area in North America open twelve months a year. The historical significance and beauty of this lodge are apparent even when approaching it from the outside. 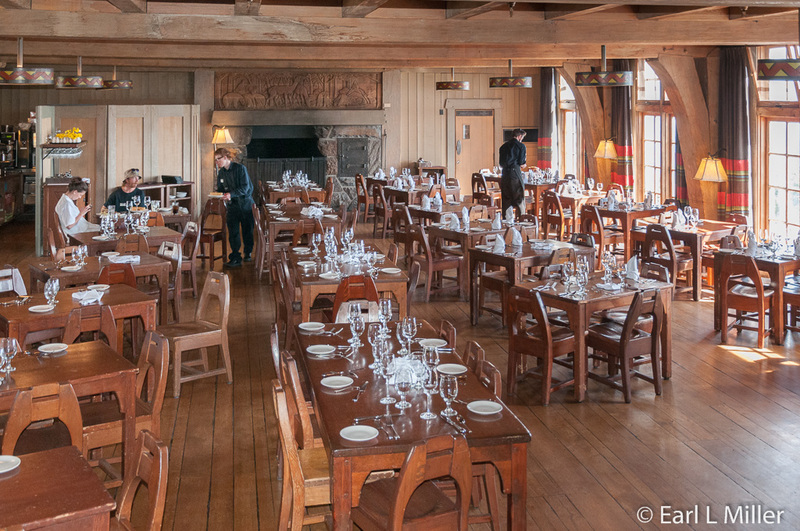 The Cascade Dining Room is known for their breakfast buffet and dinners of Northwest Alpine Cuisine. They are very pricey. For example, a half pound burger is $22 and most prices are in the $30 ranging up to $46 for a steak. We stopped in for a cold drink at the Ram’s Head Bar after visiting Government Camp. I did find the prices extremely high. For example four hot wings were $12 and smoked hazelnuts were $6.50. Sandwiches ranged from $16 to $19 and desserts such as a mini cobbler or cheesecake were $8.50. We settled on rustic bread and creamery butter for $3.50. Cold drinks were $4 each. Do take the time when visiting the lodge to view the movie in the basement level. It’s about the lodge’s construction providing insight on the very fine craftsmanship you are seeing. 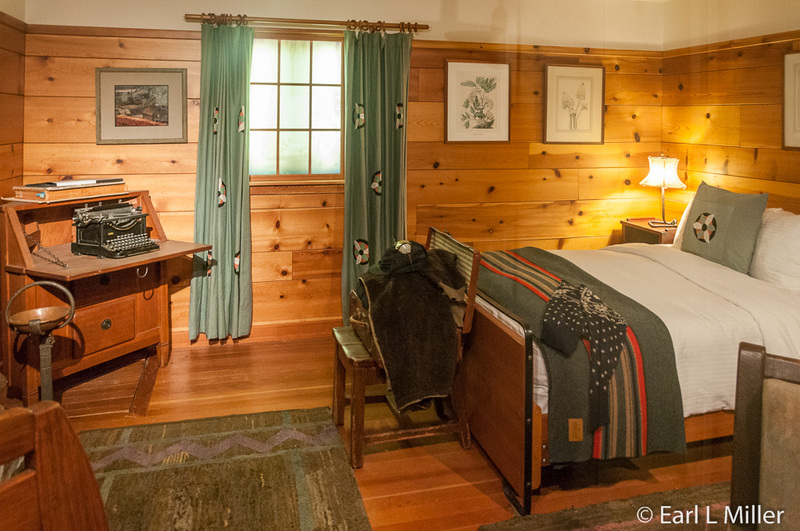 You'll also find a replica of one of the lodge's guestrooms. Its address is 27500 E Timberline Road Timberline Lodge, Oregon and (503) 272-3311 is the telephone number. At Eagle Creek, visitors find the farm of Philip Foster who arrived by ship from Maine in 1843. 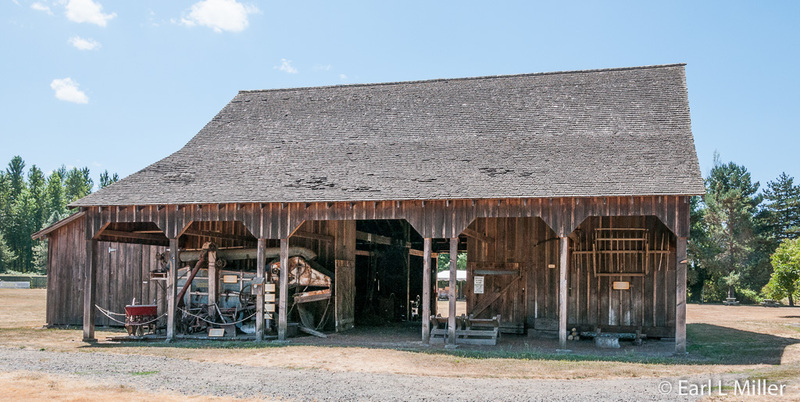 He immediately established a store and farm in Oregon City where he was the partner of John McLoughlin, “Father of Oregon,” in the establishment of a flour mill and cattle company. Foster was also the brother-in-law of Francis Pettygrove, who founded Portland, Oregon with Asa Lovejoy in 1845. It was Pettygrove who gave Portland its name. Foster was the first treasurer of the Provisional Government of Oregon in 1844-1845. He founded Eagle Creek school in 1850 and was the town’s first postmaster in 1867. Of all of his accomplishments, however, most notable was his partnership with Sam Barlow in 1845. The following year, the two men developed Barlow Road around Mount Hood for those arriving in wagon trains over the Oregon Trail. Foster moved in 1847 to Eagle Creek to maintain the road and serve its travelers as a rest stop. The number of cabins he had built is today unknown, but at least one on his property was a dogtrot with two rooms, one on each side. Immigrants often received meals as well. He also built a house, barn, store, and other structures. It is estimated that approximately 10,000 pioneers may have passed through. In 1980, the farm was listed on the National Register of Historic Places. The farm is located on the last leg of the Barlow Road. The house and barn still stand while replicas of the store, blacksmith cabin, and a residential cabin are on site. Our first stop was the store representing a mercantile store of the period. It also stocks local handcrafted items. This is the place to pay your admission and start your tour of the house and barn. On Saturdays, you’ll also find the blacksmith shop open. 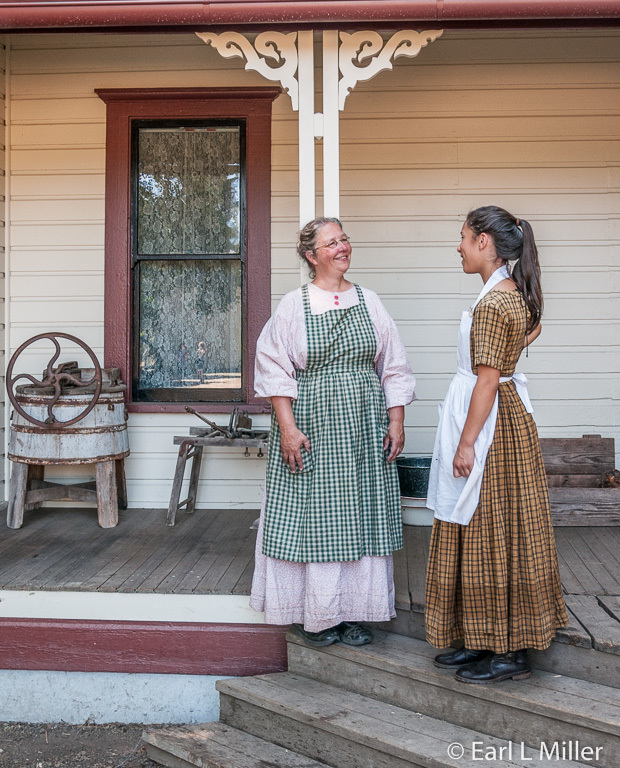 During the summer, costumed interpreters will be happy to take you around. While the barn dates to the 1860's, this is the third house. The original home was destroyed by a flood while the second was burned down by fire. Foster lived in the third home for a year before collapsing in the kitchen and dying of a heart attack in 1884. Before you enter, check out the lilac tree right outside the house. It’s the oldest tree of its species in Oregon. When you enter, you’ll find a mixture of period and Foster items. The portraits and photographs in the house belonged to the family while the furniture is representative of the time. 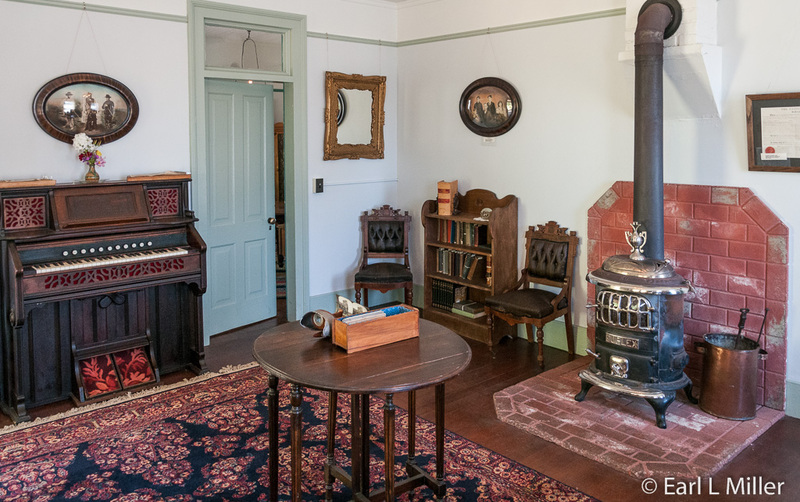 In the parlor, you will find the original land grant extended to Foster for 640 acres. He was one of the first in the Eagle Creek area to get land. 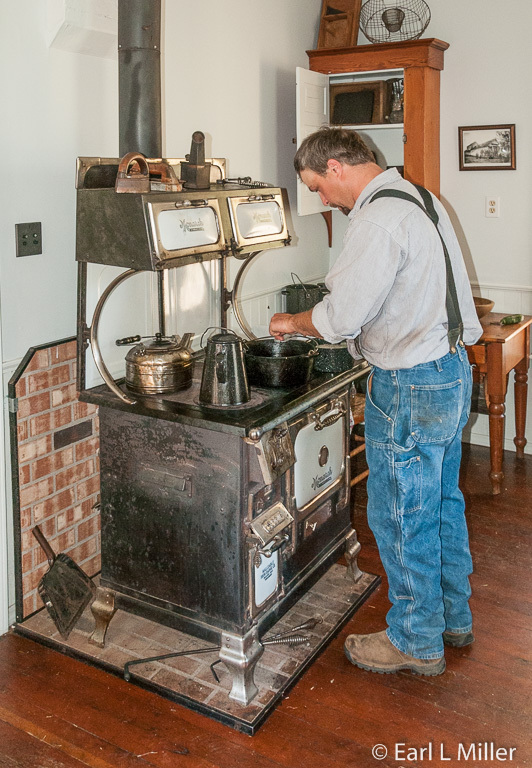 The old-fashioned stove in the kitchen is still used, almost daily, to demonstrate baking. Dan Gotchall, employee and volunteer, was making doughnuts while we were there. He offered us them. In the kitchen, you’ll find a photo of the second house. Upstairs, in the little girl’s bedroom, is the cradle the Foster children used. Lucy Foster, his daughter, lived in a house located across the street from the farm. 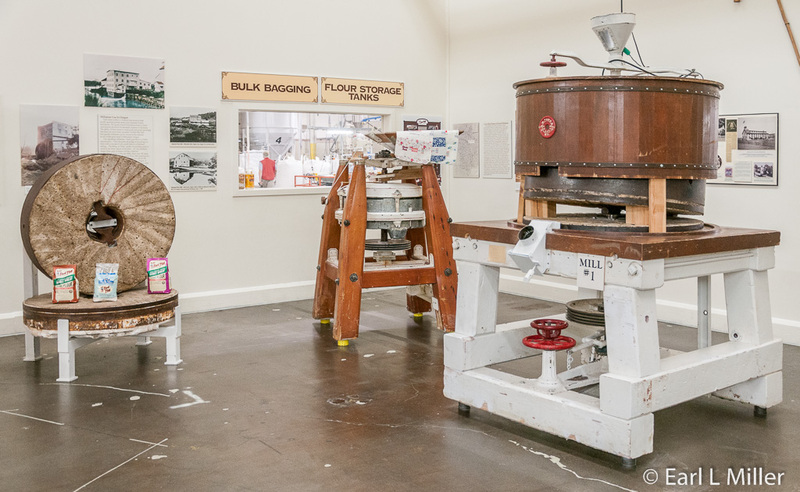 This is a “hands-on” attraction where visitors are encouraged to join in with such activities as washing laundry on a scrub board, hang it on the line, and cooking. You can build a cabin with life-size Lincoln logs, sit in a wagon, or even pack one. In the barn, you can grind corn, pull a pulley, or use a cross cut saw. 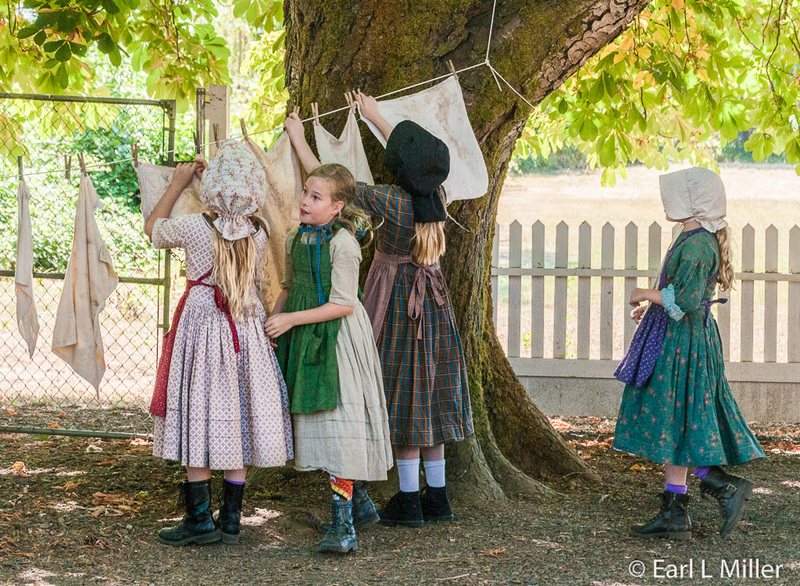 During a one week day camp for children, during the end of July, kids are encouraged to dress in costume. They play pioneer games and engage in similar hands-on activities. We were fortunate, as camp was in attendance when we were there, to see this activity. Philip Foster collaborates with Summit Learning Charter to run a fully accredited school for sixth to twelfth graders. It combines class time in a one-room schoolhouse two days a week with three days a week of online learning. The current layout of the farm was designed by a teacher for fourth graders. A lot of the volunteers are junior and senior high school students. Members of the Foster family lived at the farm until 1939. It then went out of the family. The house and barn had separate renters between 1939 and the 1980's. In the early 1980's, Ruth Powers funded the historic properties and initial repairs. She donated the structures to the Jackknife-Zion-Horseheaven Historical Society, who owns and operates the property. They opened it to the public in 1993. While at the farm, we learned more about the Barlow Road. Approximately one half of the people who traveled the Oregon Trail traversed this road as compared to these two other routes. Those were ferrying across the Columbia River and going way south on the Applegate Trail. Sam Barlow and Philip Foster were equal on the development. Barlow sold his interest to Foster, November 29, 1848, who sold his shares various times then took them back as well. The road didn’t make much money. There were costs to put someone in a strategic position to collect the tolls plus maintenance expenses. Some places had to be improved or they would have been mud wallows. Some road work was necessary just to make it passable. The fare was the same rate as ferrying across the Columbia River. 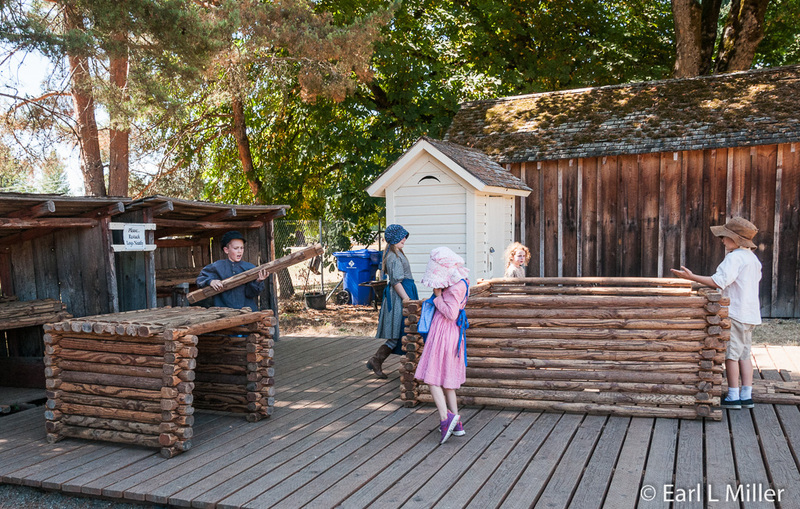 However, pioneers preferred the Barlow Trail because going on the river would take them to Fort Vancouver which was Canadian. They wanted to finish their journey on American land. Widows and Native Americans did not have to pay the tolls. Widows were allowed to use it for free because it was determined they needed help. Foster was friendly with the Native Americans. Their children played together. He gave them clothing while they provided fish and blackberries. The Philip Foster Farm is located at 29912 SE Highway 211 in Eagle Creek. The phone number is (503) 637-6324. Hours are Tuesday through Saturday from 11:00 a.m. to 4:00 p.m. from Father’s Day to Labor Day and Saturdays from 11:00 a.m. to 4:00 p.m. in May, June, September, and October. Admission is $5 per person.